Hurricane shutters are essential for homes in Pace, Florida, and surrounding cities because they provide exceptional protection in the event of a storm. These shutters are placed over a window to ensure the glass doesn’t break due to wind-blown debris or strong wind gusts. This protects your home, your possessions, and your family, making this investment an invaluable one. If you need hurricane shutters installed at your home, turn to Majors Home Improvement. We’ve installed these panels since 1997, and they meet Miami-Dade County Building Code requirements. Accordion shutters – These shutters are permanently affixed to your windows and unfold easily when needed. 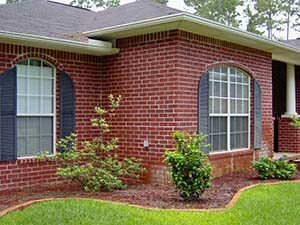 Colonial shutters – When not in use, these shutters attach to the wall next to your windows to provide decorative appeal. During a storm, simply fold the two pieces together to protect the windows. Storm panels – Available in clear and aluminum, these panels are secured to the outside of your home using bolts or tracks. Rolling shutters – These shutters are stored in a box above your windows when not in use, and then lowered (using a crank handle or motor) when needed. Bahama shutters – Attached directly above your windows, these shutters can be propped open to shade windows and completely lowered and secured to the wall to provide storm protection. Your hurricane shutters will be custom-configured for your home and installed by factory-trained professionals who are diligent and efficient in their work. Our A+ rating with the Better Business Bureau is evidence of the high-quality work we perform. If you’d like to learn more about the hurricane shutters we manufacture and install for homeowners in Pace, FL, and nearby cities, contact Majors Home Improvement today.